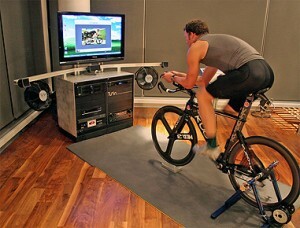 A bike trainer is a great additional to any home gym. It is a piece of exercise equipment that can be attached to a road bike or mountain bike to make it possible to use it indoors in a designated exercise room or a garage. Our team has tried many bike trainers to come up with our definitive selection of the best bike trainer products. These detailed bike trainer reviews cover the overall best bike trainer, the best trainer for the money, and the best trainer on a budget. In the first instance, if money is no object, we identify the best trainer on the market to attach a bike to and to take the bike for a spin without needing a road surface to do so. Value for money is another criteria that our readers find important to them and we also have a recommendation here. Lastly, the best budget bike trainer is selected too. Whether possessing deep pockets or not, it is always useful to see what the most impressive, low cost product in the category is to provide a useful comparison when later looking at the more expensive alternatives. Our extensive bike trainer reviews consider aspects like build quality, the materials used, ease of setup, durability, noise generated during use, and other important considerations for anyone who wants to exercise with their bike in their home. This is considered by us the best bike trainer on the market! The Kinetic Road Machine 2.0 Fluid Trainer is our Best Bike Training overall winner. 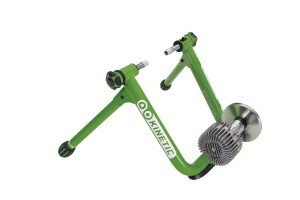 Kinetic is one of the top names in the bike trainer niche. It is fair to say that the top names in bike trainers are not the top names in the bikes niche; these companies are specialists. The Road Machine comes assembled in the box ready to use. This will be a major plus for buyers who aren’t so handy with a set of tools or do not even own their own set of tools. 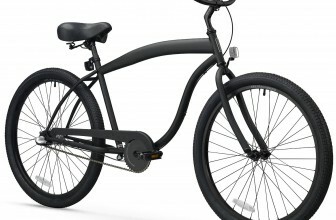 This model can fit bikes with bike frames from 22-inch to 29-inch wheels. This provides an excellent, flexible range of sizes for wheel hubs with bikes that suit men and women of different heights. The unit doesn’t only fit road bikes; the bike trainer can fit mountain bikes, hybrid bikes and other types quite comfortably. The ability to be able to push the training cycle to new levels is possible with their fluid trainer which uses a progressive resistance system that lets the rider control how hard they wish to push their cycling training. From the person who is out of shape and wants to get fit and lose some weight with a daily indoor cycling program, to the competitive cyclist who needs to be able to train come rain or shine, the smooth riding experience of the Kinetic Road Machine 2.0 Fluid Trainer fits all these needs perfectly. Both stability and long-term durability are essential qualities to look for in a bike trainer. The more rigorous the bike ride, the more the trainer needs to provide a solid platform that holds the bike and the bike trainer frame steady which allows for a safe, robust cycling workout. Whilst no bike trainer is whisper quiet, this trainer does a good job of keeping the sound to a minimum which means the actual riding motion and the occasional grunts of the rider giving it their all are likely to be louder than the sound of the bike trainer itself. Not always the case with other competing bike trainers it is fair to say. This bike is also compatible with the Kinetic inRide Watt Meter app which is available for both iOS and Android mobile devices. A newer Kinetic Fit app is also under development and is covered in greater detail later on. The Bike Lane Pro Trainer Bicycle Indoor Trainer Exercise Machine Ride All Year model is the winner in our Best Bike Trainer for the money category. The Pro Trainer model from Bike Lane has a number of features that make it stand out from the crowd. Portability is a key factor in the purchase of any trainer because the ability to move the bike trainer to another room in the home, or downstairs to the garage, is a helpful one. Exercise equipment can become cumbersome to deal with over time with remodeling projects or reorganizing projects, yet this magnetic trainer is still light enough to be carried and neatly folded down when not in use. The folding process is similar to how a standing ironing board can be folded out and later folded back down. This makes this model ideal for infrequent travel, business trips in the car, or to put into storage for a period of a few months at a time. A riser block is also included to help elevate the road bike and position it at the correct angle. Depending on the size of the cyclist, getting on and off any bike trainer can be a major issue affecting stability. The Pro Trainer Bicycle model has been created with legs that are wider than average with a frame that helps to maintain its sturdiness even with cyclists who have a robust frame of their own. The resistance used via the internal magnet ensures that this model is super quiet during operation. Whether the cyclist is exercising in the next room to someone who is sleeping or in a downstairs location adjacent to the entertainment room, this bike trainer is not going to disturb anyone. The Bike Lane Pro Trainer Bicycle Indoor Trainer has a weight capacity limit of 265 lbs, which includes both the bike and the cyclist. 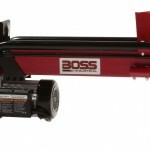 The equipment will perform well on wood, concrete, carpet and mat flooring. 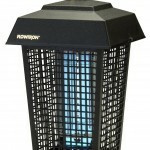 This model provides excellent value for the money paid. It is neither the cheapest nor the most expensive option for a quality bike trainer product, but it provides a good midpoint, balancing value with features pretty well in our estimation. The Conquer Indoor Bike Trainer Portable Exercise Bicycle Magnetic Stand is our winner in the Best Bike Trainer on a budget category. Stability is the key attribute in our budget winner. This bike trainer is designed to avoid slippage on a variety of surface types making this piece of gym equipment ideal in the garage, the den, a purpose built home gym, or other location to suit. There are mounting cups that help to avoid any floor slippage either during mount, dismount or with extended use. 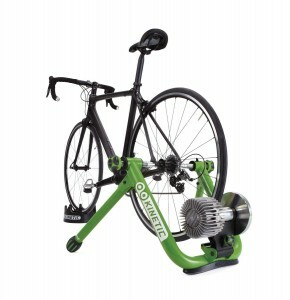 The construction of the Conquer Indoor Bike Trainer is particularly strong utilizing a wider than normal frame which helps to distribute the carrying weight across the bike trainer’s frame rather than centering it in one spot which could make it more vulnerable to tipping over during use. For anyone who wishes to ride hard over long distances, push uphill with high resistance or simply weighs a bit more, the additional stability with this model will be pleasing for the price. One normally wouldn’t expect that in a budget model which typically are made using more flimsy parts that are better suited to light use only or cyclists in a lower weight bracket. The bike trainer is suitable for 26-inch and 27-inch wheel sizes or bikes that use 700c tires. A quick release wheel at the rear is required in order to use this trainer. Various tire sizes can fit the Conquer Indoor Bike Trainer, including both a 700 x 50c tire and a 700 x 25c tire type. A front wheel riser block is included with this model which ensures that a road bike, or other type of bike, can be elevated correctly during use. Setup is simple with a skewer to fit the bike to the training equipment. One major benefit of this budget model is that it is fold-able. This ensures that the bike can be transported more easily and also put away in homes where the homeowner feels the need to save space occasionally when the exercise bike is not in use. A bike trainer is not necessarily something that everyone thinks of when considering getting fit or training for their next race. Often people mistakenly believe that there is only a single choice of either a stationary/exercise bike or a bike suitable for the road. In fact, a bike trainer provides the best of both worlds because it can extend the use of a road bike or mountain bike to be something that can also be used indoors within a fairly small workout area. This makes it ideal for people who don’t have space for a gym in their home, but do have enough room for a bike trainer and the attached bike in a small corner somewhere. A bike that has been converted for use with a bike trainer can easily be converted back to a road bike again. Whilst we wouldn’t recommend considering doing this on a regular basis, it is certainly possible using fast release rear wheel technologies. This is a far cheaper option than buying both a road bike and a stationary exercise bike which will take up far more storage space in the home or garage area. A bike trainer can also be used with an older bike where it has been replaced with a newer model but still is capable of being ridden. This older model can be used with a bike trainer and this saves on it cluttering up the garage, needing to be free cycled, sold or thrown out. The use of a bike trainer is also helpful to anyone looking to lose weight and be consistent with the progress towards the attainment of their weight loss goal. Especially when living in a state with poor local weather conditions or extremes in temperature throughout the four seasons, a bike trainer can allow for an effective indoor exercise routine that replaces the outdoor one when the weather outside doesn’t support outdoor cycling. Instead of making an excuse that the weather is too bad, skipping the workout and losing the exercise habit it took weeks to create, a bike trainer can help the goal-oriented exerciser to stay on track with their fitness and weight loss goals in any weather conditions. For anyone who is really serious about getting fitter or squeezing into a pair of slimmer jeans in a few months’ time, this will be an important consideration. As a side note, being able to ride indoors is much safer than riding on the roads however careful the cyclist is. A reputable brand is something to look for first. Kinetic is a leader in bike trainer technologies, with Bike Lane and Conquer not far behind in the pack. The frame and materials used is a key element for any good bike trainer. 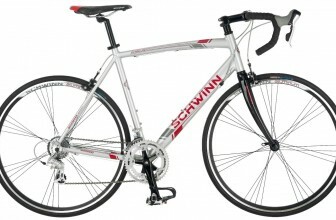 If the frame uses cheap aluminum or other materials that won’t stand the test of time, then whether the product comes with a reliable guarantee or not, the purchaser will have to go through the inconvenience of putting the item in for repair or worse yet, replacing it with a new, better bike trainer in the future. Wider frames whilst taking up more space in a room in the home will most likely be a good feature to look out for. The wider base helps to spread the load and dissipate the considerable vibrations caused by cycling quickly. Unlike with road bikes, the lighter materials are not such a benefit with bike trainers. The trainer needs to sit on the floor and not slide around when in use. The process of climbing on the bike, starting to peddle and really pushing the bike for all its capable of can cause lesser, lighter frames to shuffle around the floor. Not only can this cause problems with other items in the room becoming damaged, but it creates a stability issue too. If feeling unsteady when climbing onto a bike affixed to a bike trainer for the first time, then this is a feeling not to be brushed away as a trivial matter. Steady bike trainer frames are important. A quality piece of equipment should be designed to take noise into consideration. Many owners of bike trainers will be bike owners who wish to train at home when the weather isn’t cooperating or it is too late to riding outside safely. For this reason, they’ll want to consider either other occupants of the home or the neighbors when climbing on their bike. The recommended bike trainers manage the noise factor well with better mechanisms and smarter designed elements that do their utmost to keep noise to a minimum. With that said, pedaling a bike does in itself create a certain amount of sound, particularly via the tires, as does the cyclist themselves when really pushing their activity level to get the heart rate up to an optimal level and to maintain that. Just something to bear in mind. Depending on the manufacturer, there may be an app available for iOS or Android users, which can provide useful information on speed, weight, gear selected, watts or calories expended. Many such apps use Bluetooth technologies to provide feedback, some with more success and accuracy than others. Mini computers can also be added to the handlebar to inform the rider with cycling metrics about the use of the bike. The Kinetic Road Machine 2.0 Fluid Trainer is our Best Bike Trainer because it hits the spot with its range of useful features, build quality and the technology used in its design. It also comes with a lifetime warranty, which is impressive. 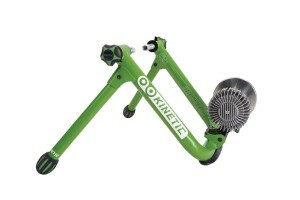 Kinetic is a respected name in bike trainers. Whilst not perhaps a household name in the bicycle market itself, when it comes to the more specialist bike trainer niche, Kinetic is a name one can depend on. Their Fluid Trainer is intended for professional cyclists who need to keep in shape during the off-season and for amateurs who like to use cycling as a way to keep fit or lose weight come rain or shine. Unlike with treadmills and other exercise equipment, riding a bike is largely free of impact damage, which is common to runners and joggers who tend to have trouble with their knees later in life from running on concrete too often over the years. A bike trainer really helps to provide new exercise options with the ability to exercise on the bike either outdoors as weather permits, or indoors when weather conditions are atrocious. With this Kinetic model, they also take things to the next level with their innovative, leakproof, fluid trainer system. The unique fluid system works by rotating a blade inside the fluid container. Just like when swimming and pushing through the water with a pair of hands, the motion of turning a blade through fluid creates a form of active resistance. The Kinetic fluid trainer uses a magnetic coupler that has been patented by the company to protect it. The design has also been made to be leakproof, so homeowners do not have to be worried about creating an unexpected water overflowing problem should they become a bit too energetic with their cycling one day. There is an acceleration curve to how the blade cuts through the water in conjunction with the magnetic coupler. This provides a similar feeling to a regular bike ride outdoors. A high level of precision is used in the construction of each fluid unit to provide a consistent riding experience that is on point. This feeling is also carried over when altering speed or changing gears with an appropriate sensation when riding with the assistance of this bike trainer. For the design, a special silicone that is surgical grade ensures that however fast the fluid is moving inside the fluid unit, it won’t heat up. This prevents a power loss due to overheating in the middle of a bike ride and also ensures that the fluid unit doesn’t sustain any damage from regular use either. The Kinetic-branded trainer feet and the adjustment knobs are all made using ABS plastic, with rubber included for improved grip, to be longer lasting, and offer more comfortable ergonomics. The sturdy frame gets its strength from being tig welded steel that’s then been coated with powder. 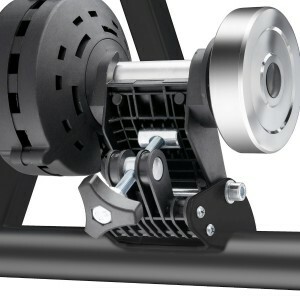 Each section that makes up part of the structure of this bike trainer uses either strengthened aluminum or steel. The Road Machine 2.0 Fluid Trainer is an upgraded version of the original Kinetic Road Machine Fluid Trainer. The improvements include an overall reduction in weight by a pound, a tweak to the frame so it will fit 29 x 2.4-inch tire sizes, and the addition of rubber to the original plastic feet and knobs offering the improvements described at the end of the previous paragraph. Setting up the Kinetic Road Machine 2.0 is easier than one might imagine because it comes pre-assembled in the box. It is just a matter of pulling the bike trainer out from the packaging, extending out the legs, and using the skewer tool to put the bike on it. Centering the bike is the most important thing when using the skewer tool correctly to connect the bike up to the bike trainer. It literally only takes a few minutes to set this Road Machine up right. The Kinetic Road Machine 2.0 Fluid Trainer can be purchased already assembled in the box which makes it very convenient. The configuration of the frame is such that it will fit many types of road bikes or mountain bikes from frames with 22-inch wheels right up to 29-inch wheels which provides great flexibility. It does lack a bike riser, which can be purchased separately. Kinetic offers the Kinetic inRide Watt Meter optional accessory which uses a Bluetooth connection to measure the fluid trainer power curve. This aims to calculate the wattage readings from the Kinetic fluid trainer to determine speed. The Kinetic inRide Watt Meter app can provide basic feedback to the cyclist. Kinetic is also in the process of creating a newer Kinetic Fit app which will be available for both iOS and Android. The Kinetic inRide Watt Meter with Heart Monitor and their Kinetic inRide Power Meter can be purchased separately. A Kinetic fixed position riser and a Kinetic turntable riser is also available; a riser is not included with the Road Machine 2.0 Fluid Trainer which is slightly disappointing. For the complete set of Kinetic products, an attractive black exercise training mat adorned with the white Kinetic logo is an optional extra to protect the floor where the trainer is to be set up. The Kinetic Road Machine 2.0 Fluid Trainer ticks all the boxes as an excellent bike trainer to keep cyclists exercising and racking up the miles whether road conditions permit it or not. The Bike Lane Pro Trainer Bicycle Indoor Trainer Exercise Machine Ride All Year is a bit of a mouthful, but we’ve found that it offers the most value in the Best Bike Trainer for the money category. This trainer has been created to work best with 26-inch or 27-inch wheel diameters or 700c bicycle. Bike trainers use the process of resistance to help match both increasing speed and gear changes to the cyclist’s performance. Different trainers uses different mechanisms in order to create the resistance that the cyclist can use get a quality cycling workout. In the case of this Bike Lane product, a strong magnet is utilized to generate the increasing force, which can be felt while pedaling and following each gear change. The system works remarkably well and does so whilst operating in whisper quiet fashion. There are five separate resistance levels, which can be switched between using a convenient controller. During prolonged use, sound can emanate from the tires, which can vary from rider to rider. Smaller tires with a close cropped tread pattern is usually quieter when used with this product whereas tires designed for riding on grass or dirt with a deeper, wider tread can make more sound when riding the bicycle with this trainer. This is a minor issue as any indoor exercise bike will make some sound during use. It is fair to say that we don’t usually hear the sounds that tires make when cycling outside because of the ambient sound in the vicinity. This trainer has been designed to be more stable than other bike trainers. This has been achieved using a sturdier metal frame with wider than average legs. The ends of the frame uses rounded components that act as foot pads to help stop the legs from slipping on the floor. These footpads are also adjustable for uneven floor levels. The matte black finish of the strengthen materials used in the trainer frame is attractive and juxtaposes the rainbow of colors that adorn the frames of most commercially-available bicycles. The smooth steel flywheel is also present to help create a more natural feel for the cyclist when peddling their bicycle. The Bike Lane Pro Trainer Bicycle Indoor Trainer Exercise Machine Ride All Year can be used on a variety of surfaces, including concrete, carpet, wood or mats. This makes this bike trainer usable in a converted garage/gym, on wooden flooring, outdoor wooden decking, carpeting or mats. Gym mats can be a useful addition for anyone worried about this bike trainer shifting across the floor during use and scuffing or damaging the existing floor surface. The bike frame has a maximum weight capacity of 265 pounds, including the weight of the road bike or mountain bike itself. The product comes with its own front wheel riser block and fast release skewer tool. One of the conveniences of the Pro Trainer Bicycle Indoor Trainer is that it isn’t overly heavy and can be folded down quite quickly to a smaller size for transportation or easy storage. This means that the bike trainer can be placed inside a vehicle more easily than some other trainers which have to be completely dismantled each time they are required to be relocated. For anyone who travels often on business and doesn’t want to rely on a hotel having an accessible gym, the quick folding feature is a must. The Bike Lane Pro Trainer Bicycle Indoor Trainer Exercise Machine Ride All Year is a good product at a lower price than what is typical, which makes it excellent value for money. Bike Lane is not the most well known of brands in the marketplace. However, whilst the use of their magnetic trainer mechanism to create resistance is a common approach that is no longer innovative, it does manage to achieve the desired result with 5 levels of resistance. Whilst not flashy, this trainer performs well, is built using solid materials and can also be folded down fairly easily. Given the wider leg design which takes up additional floor space, the portability of this Bike Lane Pro Trainer Bicycle is also good to see. This bike trainer offers excellent value for money. The product also comes with a 100% product guarantee. 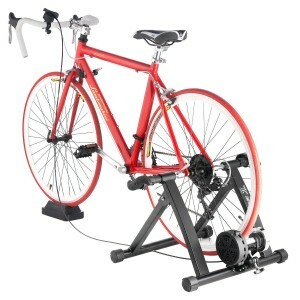 The Conquer Indoor Bike Trainer Portable Exercise Bicycle Magnetic Stand is a budget category winner. The Conquer Indoor Bike Trainer is built around a solid construction and a wider frame that affords greater stability when climbing on the bike, during use, and when climbing back off again. The frame has been designed to use up more floor space, but this sacrifice pays off with a more sturdy performance due to a better distribution of the weight of the bike and the rider when in use. There are mounting cups with spaced-out grooves that are used to provide more grip on the floor surface. The bike trainer frame is also designed to be easily fold-able for travel, transport or simple storage without taking up too much space. It is nice to see that even the budget models offer the folding bike feature rather than leaving that feature out completely. 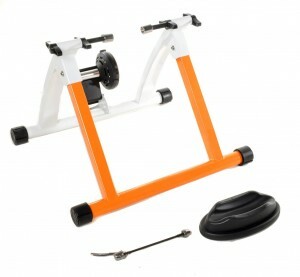 The colors used on the bike trainer frame is a white and orange two-tone affair. The bike frame feet are black, as is the magnetic resistance system, along with the front wheel riser. There is nothing particularly noteworthy about the color scheme used. The Conquer branding is unnoticeable, unlike with the Kinetic or Bike Lane trainer models which make more of a show of it. Depending how the cyclist feels about showing off the brands of the products they buy, this may or may not matter to them. This bike trainer is intended for use with bikes with a 26-inch or 27-inch wheel hub diameter or bikes using 700c bike tires. Indeed, a variety of tire sizes are supported from 700 x 25c to 700 x 35c up to 700 x 50c. 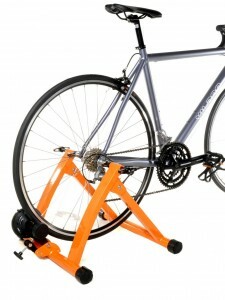 There is also the suggestion that some 28-inch diameters wheel hubs can also fit this affordable bike trainer. In the latter situation, the back hub may need to be adjusted carefully to the surface of the wheel for a perfect fit. Any bike to be used with the Conquer Indoor Bike Trainer needs to have a fast release rear wheel. The pre-assembled bike trainer comes with a skewer to help fit the bike to the bike trainer correctly. There is also a front wheel riser provided to elevate the front wheel sufficiently for the trainer to function properly. A magnetic resistance system is used to provide multiple levels of active resistance. The magnetic resistance increases naturally as the cyclists runs through their gears, pushes harder and rides faster. The cyclist is forced to push themselves more in order to maintain the same speed which ensures that the leg muscles get an intense workout during any riding session. It is an easy matter to adjust the level of resistance to suit the rider. Sound emanation levels from this bike trainer are fairly typical. Most of the sounds heard come from the bike being ridden and the tires, rather than directly from the operation of the magnetic resistance system. Mountain bike tires tend to be the most noisy, where as slimmer road tires are quieter by design. It is also possible to disable the resistance completely for early morning or late night rides where the cyclist doesn’t wish to disturb other people sleeping next door. The noise level also depends on how hard the rider pushes themselves; a slower ride produces less friction and therefore, less noise. The bike trainer will work well on many different kinds of surfaces from concrete to carpeting to wooden floors. It is advisable to consider buying a rubberized training mat to sit the bike trainer on because the rubberized surface can provide additional grip and also help the cyclist not lose their footing when climbing down due to the added grip that the mat flooring provides. The Conquer Exercise / Bike Mat Trainer Equipment Mat would be an ideal, affordable solution here. The Conquer Indoor Bike Trainer Portable Exercise Bicycle Magnetic Stand won our budget category because it brings a lot to the table for a low price. The magnetic resistance system is not dissimilar to other systems on more expensive bike trainers. There are the usual floor grips and a steady frame which should handle men or women riders up to 250 lbs. It is tough to do any better for the price. 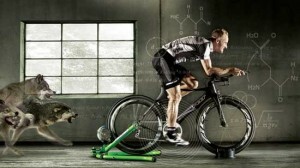 One of the main considerations with a bike trainer is to ensure that it will fit the bike that it is to be attached to. Should a riser not be included with the product (it isn’t in all cases), then a separate riser should be purchased in order to position the bike correctly when first setting it up. The type of tires and the type of bike that is to be attached to a bike trainer are also key considerations to think about before purchasing any bike trainer. As has been alluded to some of the above review, mountain bike tires tend to be larger with deeper treads and as a result are noisier during use. This isn’t noticed when outside, but indoors, this difference when compared to using a road bike with slimmer tires, becomes more noticeable. This isn’t the fault of the bike trainer equipment. 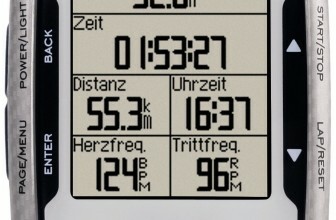 Whilst using a bike trainer with a regular road or mountain bike indoors alone doesn’t require the many accessories that a “tricked-out” outdoor road bike often requires, one recommended extra is a dashboard bike computer. The Bell DASHBOARD 100 12 Function Cyclocomputer is one such product that comes recommended. It can be easily fitted directly to the handlebars on the bicycle. 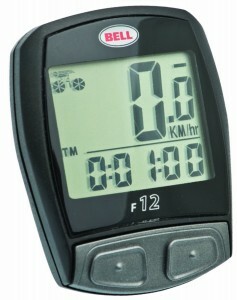 This bike computer has 12 easy to use functions that can verify the approximate cycling speed, distance covered, time using 12/24 hour clocks, period of activity, automate start/stop time based on pedaling speed, and many other functions besides. A bright LED screen is used to convey crucial information to the cyclist to inform them during their ride. Only a single cell battery is required to power the mini computer (which is also included). Should the cyclist later choose to release their bike from the bike trainer they’ve been using, the Bell Dashboard 100 can be taken outside with the bike because it’s weather-resistant too. Following our in depth look at the best bike trainers available in the marketplace, the three bike trainers given a full review above represent the best bike trainer, the best bike trainer for the money, and the best bike trainer on a budget. With a little more money to invest in a quality product, a better brand, improved materials and a more innovative resistance system does pay dividends. On the lower end of the price scale, the two less expensive products reviewed won in their respective categories due to providing compelling features that are perfectly usable for seasoned cyclists or people interested in fitness/weight loss without sacrificing performance.